The USS California, right, after being struck by a torpedo and a bomb during the Japanese attack on Pearl Harbor on Dec. 7, 1941. On Dec. 7, 1941, the Imperial Japanese Navy staged a surprise attack on the U.S. naval base at Pearl Harbor. Five U.S. battleships sank or were severely damaged, several hundred warplanes were destroyed and more than 2,400 people died. In an historic speech, President Franklin D. Roosevelt called it "a date which will live in infamy." As the United States prepares to mark the 70th anniversary of Pearl Harbor, two new books revisit the the most devastating foreign attack on U.S. soil until the Sept. 11 terror attacks in 2001. Historian Craig Shirley was born more than a decade after the end of World War II, but the war was ever-present during his childhood. “December 1941, 31 Days that Changed America and Saved the World,” by Craig Shirley, explores the days surrounding the Pearl Harbor attack and the US entry into World War II. President Roosevelt had resisted joining the war in Europe. He had been re-elected to a third term. The nation was gradually climbing out of the Great Depression. “Franklin Roosevelt made public speeches saying to American mothers, ‘I’m not going to send your boys to fight a European war,'" Shirley says. But all that changed when Japan attacked Pearl Harbor. 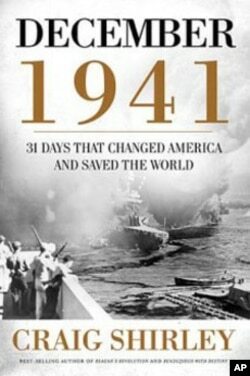 In his book, "December 1941: 31 Days That Changed America and Saved the World," Shirley dedicates each chapter to a day, starting on Dec. 1. On Dec. 8, President Roosevelt addressed a joint session of Congress with his famous speech. Forty minutes later, Congress declared war against Japan. On Dec. 11, Germany declared war on the U.S. and America joined the battle. Going to war, Shirley says, changed America. “Women built airplanes, tanks and learned how to become firefighters," he says. The nation’s capital changed overnight. In “December 1941: Twelve Days that Began a World War," historian Evan Mawdsley explores how Pearl Harbor marked a turning point in the direction of the entire century. 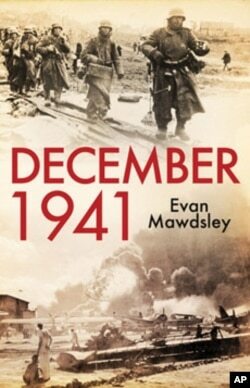 While Shirley focuses mostly on what happened in the United States, another book, “December 1941: Twelve Days that Began a World War," offers an international perspective. According to Mawdsley, the world after Dec. 7 became fundamentally different from the world just one day before.